Emilie is born in Kristiansand, and grew up in Larvik. She started playing the horn in the local school band when she was eight years old and her first teacher was Cecilie Lindflaten. In 2013, she started to study at Barratt Due Institute of Music, with Frøydis Ree Wekre as her teacher. From 2015 to 2018 she was student at Sandefjord Videregående Skole (high school), with Anne Holt Hasle as her teacher. Besides school and Barratt Due she played in Vestfold Youth Symphony Orchestra, Nanset Wind Ensemble, Barratt Due Symphony Orchetstra, the brass quintet “Quintetto Brasso”, Chamber Academy (wind octet), a wind quintet and Mozart hornquintet (violin, viola, viola cello and horn). At the moment, Emilie is a student at the Norwegian Academy of music in Oslo. She has started on her Bachelor of Music Performance Programme. As her proffesors, she has Steinar Granmo Nilsen and Frøydis Ree Wekre. 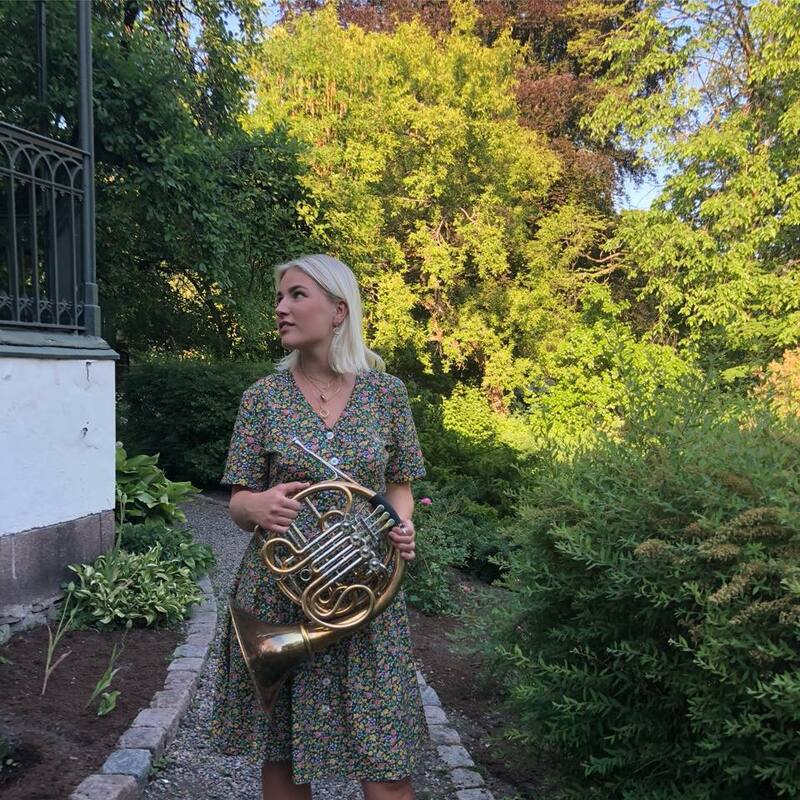 Emilie has participated in several music courses such as Valdres Sommersymfoni (symphony course in Valdres, every year since 2013), NUSO (Norwegian Youth Symphony Orchestra) (2014), Nordic Horn Festival (2012), and Young Philharmonic in 2016 and 2017. After an audition, Emilie was chosen as one of 80 Nordic talents to play third horn on Prokofiev’s fifth Symphony in 2016 and third horn on Berlios’s Symphony Fantastique in 2017. In the beginning of 2018, Emilie won the audition for playing principal horn on Shostakovich’s 10th Symphony. In January 2018, Emilie won the EMCY prize at Ungdommens Musikkmesterskap (Norwegian Music Competition for Youth). The summer 2018 Emilie was taken out after audition to participate at a three weeks long cours with the Norwegian National Youth Orchestra. The orchestra went on a tour to Berlin and took part of the «Young Euro Classics» festival. She has played several masterclasses and have had lessons with known musicians such as Stefan Barratt Due, Frøydis Ree Wekre, Denise Tryon, Arnulf Naur Nilsen, Rex Martin, Cecilie Løken, Jesper Busk Sørensen, Guillaume Jehl, Julian Plummer, Julius Pranevičius and Tine Thing Helseth. If you are interested in working with Emilie, please get in touch with the EMCY Office.